Kozak's Classic Cinema | Commentary on classic movies from the birth of film to 1950. 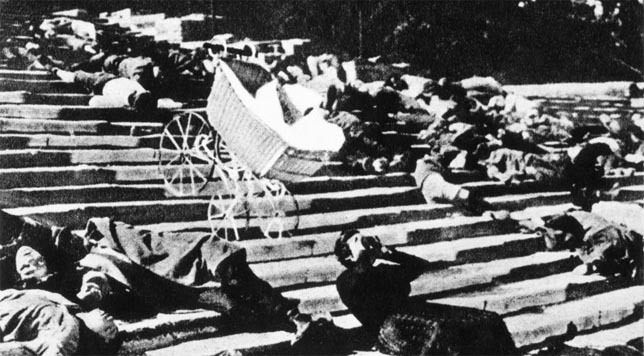 Battleship Potemkin (1925). 75 minutes. Directed by Sergei Eisenstein. Starring Alexsandr Antonov (as Grigory Vakulinchuk), Vladimir Barsky (as Commander Golikov), Grigori Alexsandrov (as Chief Officer Giliarovsky), Mikhail Gomorov (as militant sailor), Alexsandr Levshin (as petty officer), N. Poltavseva (as woman with pince-nez), Beatrice Vitoldi (as woman with baby carriage), Konstantin Feldman (as student agitator), and Lyrkean Makeon (as masked man).